Dark, bountiful blackberries tartly sweeten our premium high-grown blend of Chinese and Indian black tea. Brew this fruity tart tea and get a taste of nature’s wild blackberries. Keep your tea fresh for many breaks to brew with this beautiful and reusable black tin; that’s portable too! 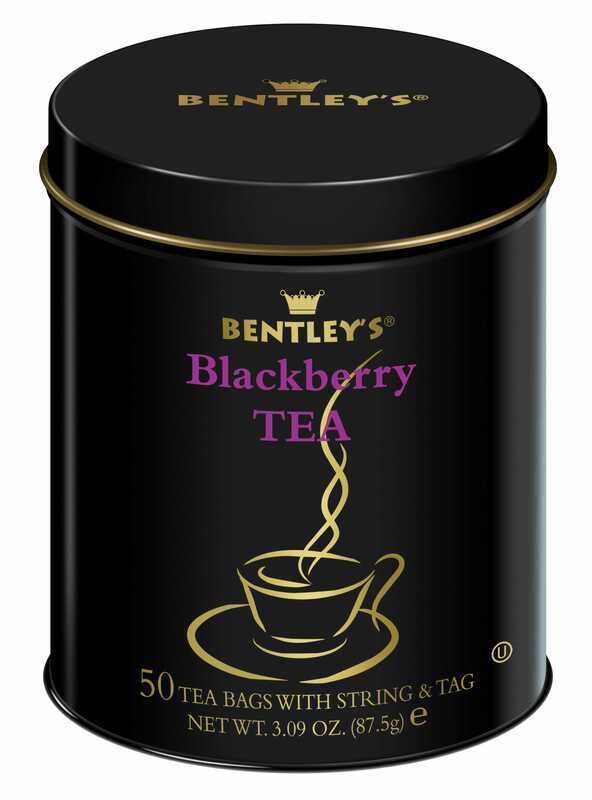 Drink a cup of royalty with Bentley’s Finest Tea! This tea makes me think of my little girl (who is not so little anymore – she’s 9!) because while she enjoys most types of fruit, blackberries are her favorite. In the house that we lived in a few years ago, we had a blackberry bush and she would eat them fresh off the vine! The aroma of this tea is much what I would expect with a blackberry flavored black tea – it smells like blackberries and black tea. No big surprise there. That being said, it is a very pleasing fragrance – sweet, fresh and fruity. The cup possesses a very nice balance of flavors. The black tea is a medium-bodied tea with a somewhat mellow presence. It is not overly aggressive and yet it is able to hold it’s own and isn’t overpowered by the fruit. There is a light-to-medium astringency. By that I mean that it starts out quite light, to the point of being barely there. But by mid-cup, the astringency becomes a little more prominent and provides a dry finish. The berry flavor is sweet but not overly so, with a twinge of tartness that arrives upon the palate in the aftertaste. It has a very distinct blackberry taste to it; that is to say that it doesn’t taste like “berry”… it tastes like blackberry. And it tastes good! There is a wine-like essence to the cup with the berry flavor and the somewhat dry finish. But I think I’d rather sip on this than a glass of wine! Especially during chilly days such as this – I am finding it very comforting. And as delicious as this is hot, it is just as refreshing iced. Another fine tea from Bentley’s Finest! Excuse me, are you interested in some tea bags to detox ?